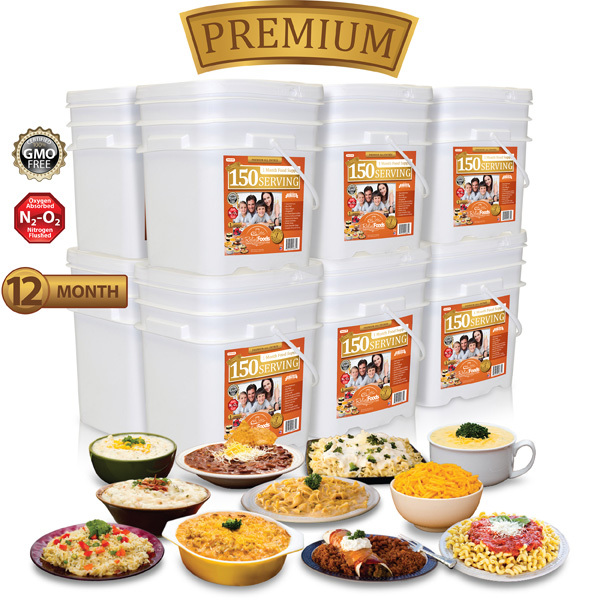 Relief Foods 130 Serving, 1 Month Emergency Food Supply Bucket, is our most popular and best selling emergency food bucket. Packed in strong oxygen resistant Mylar pouches, these 7 different entrée and breakfast menu items are among our top selling food items. 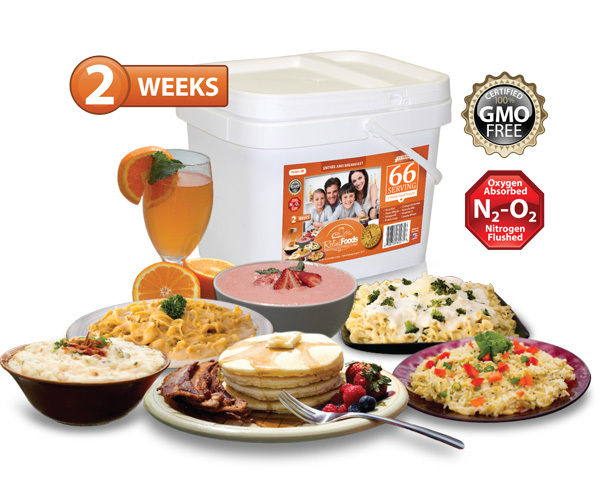 Complete with Rice Pilaf, Pasta Alfredo, Stroganoff, Potato Soup, Orange Drink, Pancake Mix, and Strawberry Creamy Wheat meals this bucket is one of our most nutritionally packed and tasteful options. We have done the work of putting together the perfect 1-month food supply, so that all you have to do is decide on how many buckets you need to feel secure. With up to a 25-year shelf life you can feel comfortable knowing you have the value leader in your home for many years to come. 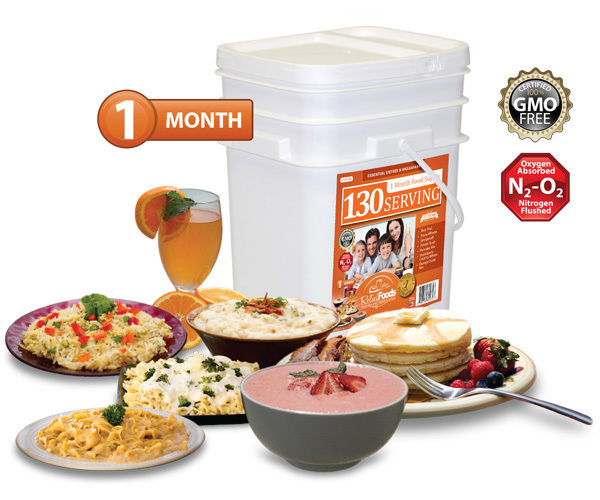 A product and a company built with family in mind, this 1 Month Emergency Food Supply bucket shows why Relief Foods is a Value Leader in this industry. Included Inside: Rice Pilaf (18 Servings), Pasta Alfredo (18 Servings), Stroganoff (18 Servings), Creamy Potato Soup (18 Servings), Buttermilk Pancake Mix (24 Servings), Strawberry Creamy Wheat (18 Servings), Orange Drink Mix (16 Servings). Relief Foods (gluten-free) all fruit bucket is a nutritionally packed selection of delicious fruit. 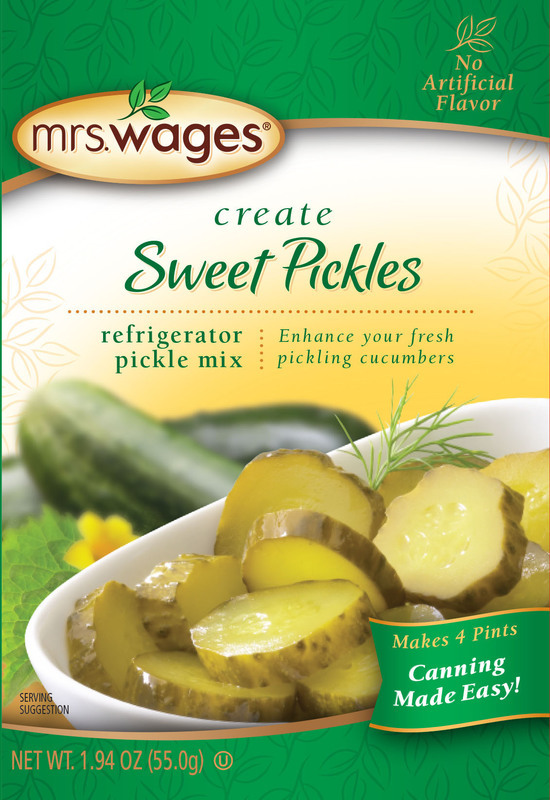 The fruit comes packaged in a three-gallon polyethylene bucket designed for space saving stackable storage. Three delicious fruit options are available in our gluten-free bucket, apple slices, banana chips and mango dices. Having the ability to add fruit to your emergency food storage will give you peace of mind that your family will be well cared for in times of need. Creating delightful options is what we do, keeping family in mind. 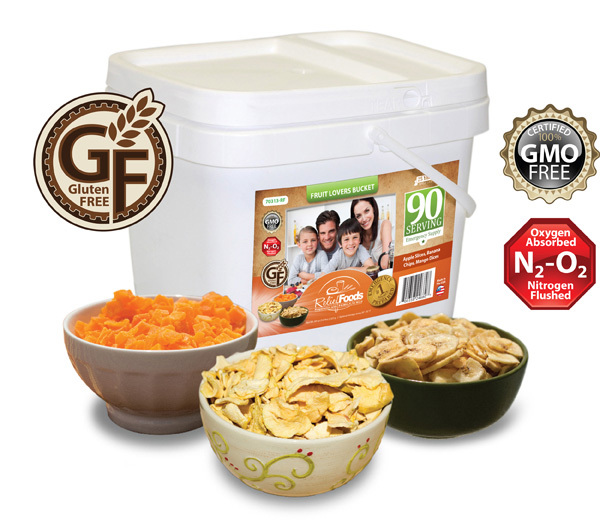 Relief Foods 100-serving (gluten -free) Entrée and Breakfast Bucket is an exciting new addition to our product line. This package offers breakfast, entrée, soup, and drink options that are 100% gluten-free. 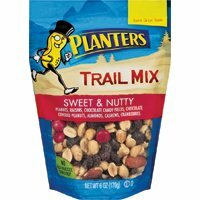 Packaged in a three-gallon polyethylene bucket for space saving stackable storage, are three-weeks of delicious gluten-free products. In this package you will find our delicious Enchilada Beans and Rice, Cheese and Broccoli Bake, Classic Chili Mix, Creamy Potato soup, Corn Chowder, Cheddar Broccoli Soup, and Oatmeal with Brown Sugar. Completing the package you will receive two of our delicious drink options, Orange Drink Mix and Powdered Milk. Another Relief Foods bucket prepared with family in mind. Included Inside: Enchilada Beans and Rice (18 Servings), Cheese and Broccoli Bake (12 Servings), Classic Chili Mix (18 Servings), Creamy Potato Soup (12 Servings), Corn Chowder Soup (6 Servings), Cheddar Broccoli Soup (6 Servings), Orange Drink Mix (8 Servings), Powdered Milk (8 Servings), Oatmeal with Brown Sugar (12 Servings). This 12 bucket selection offers sixteen of our top Entrée Menu Items. 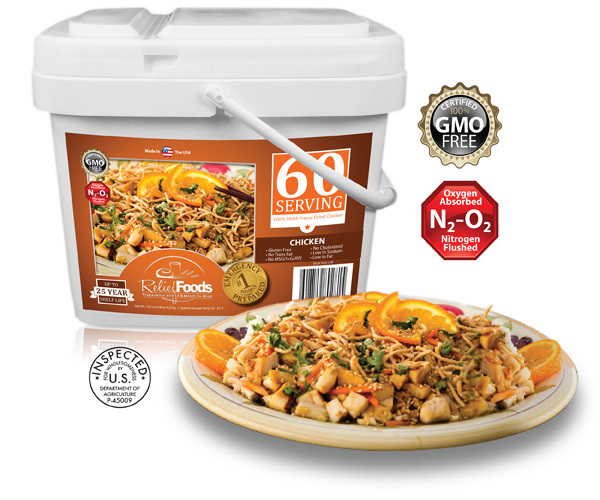 Relief Foods 450-Serving Premium Entrée Bucket is built for taste and nutritional value. 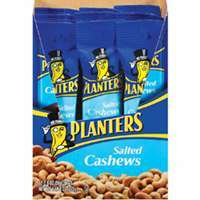 These food lover favorites combine to give you a twelve-month emergency food supply for one adult member in your family. Included in this combo is Pasta Marinara, Rice Pilaf, Pasta Alfredo, Stroganoff, Enchilada Beans and Rice, Cheese and Broccoli Bake, Macaroni and Cheese and our Classic Chili Mix. A delicious variety of our top soups is also offered, Creamy Potato Soup, Corn Chowder Soup and Cheddar Broccoli Soup. With a 25-year shelf life you can rest comfortable knowing you have a trusted and family-minded product in your home for years to come. 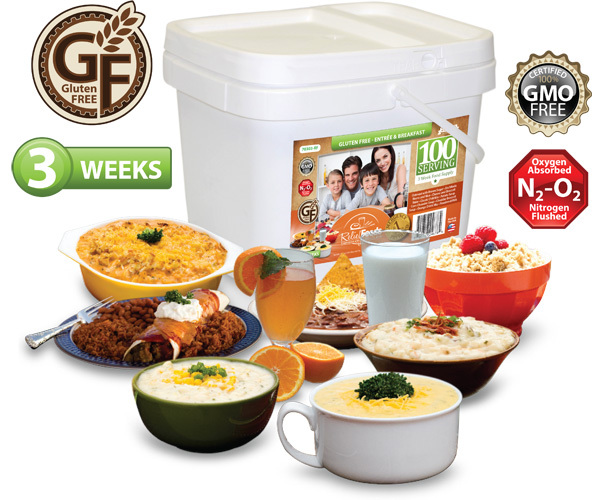 This twelve-month food supply bucket is another great item from Relief Foods who values preparation with family in mind. Included Inside: Italian Pasta Marinara (216 Servings), Rice Pilaf (144 Servings), Pasta Alfredo (216 Servings), Stroganoff (144 Servings), Enchilada Beans and Rice (144 Servings), Cheese and Broccoli Bake (144 Servings), Macaroni & Cheese (216 Servings), Classic Chili Mix (144 Servings), Creamy Potato Soup (144 Servings), Corn Chowder Soup (144 Servings), Cheddar Broccoli Soup (144 Servings). ALL-AMERICAN BEEF & CHEESE STICKS 100% beef stick and creamy American cheese 1.2 ounce package Blended from natural barrel cheeses 01139 1.2OZ ALL AMERI B/C STIC SIZE:1.2 Oz. 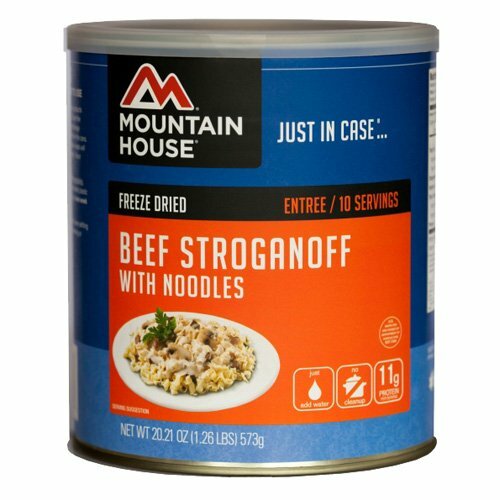 Mountain House Beef Stroganoff is hands down one of the most popular meals Mountain House makes. Made with real pieces of tender beef and savory mushrooms and onions in a creamy sauce, one bite will make you a believer. 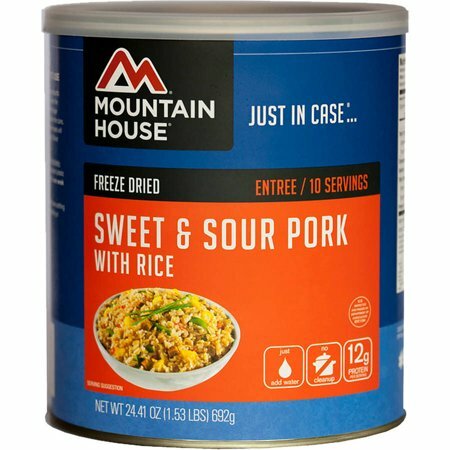 Great for those times when the power goes out, or the kids bring the soccer team home for dinner, with Mountain House #10 cans, you can feed a group in minutes. 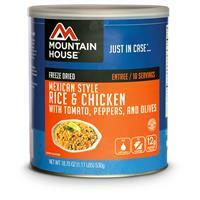 With Mountain House trademark just-add-water, convenience you can enjoy this hearty meal anywhere! If you like scrambled eggs and smoked bacon for breakfast, this is the Adventure Meal for you. 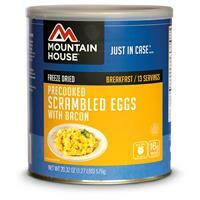 Each Mountain House Scrambled Eggs and Bacon Can contains 16 servings, youG++ll have enough to feed the whole group! Extremely simple to make, just add hot water and in a few minutes youG++ll have a delicious breakfast! The ideal camping meal. 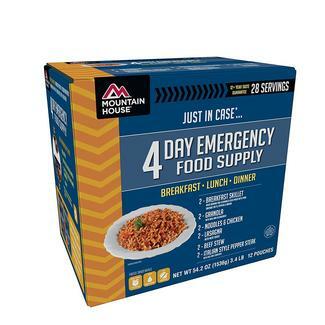 Now you can easily customize an emergency food supply with Mountain House Just in CaseG++ Emergency Food Supply 4 Day Supply Kit. 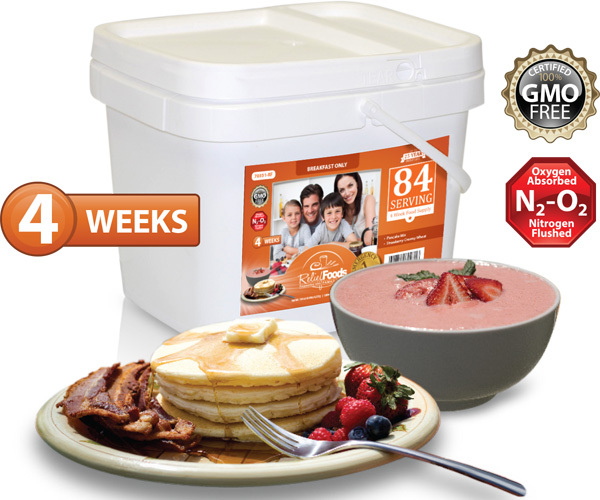 This stackable 4-day boxed kit contains a variety of popular breakfast, lunch and dinner entrees for one person. Are you looking for a 7-Day supply? Consider combining the 2-Day with the 5-Day kits. Or select the variety of meals that are included with the 3-Day and 4-Day kits instead. Customize your emergency food supply foundation to fit your taste preferences and budget. This bucket contains a convenient two-week food supply for one adult in your family. 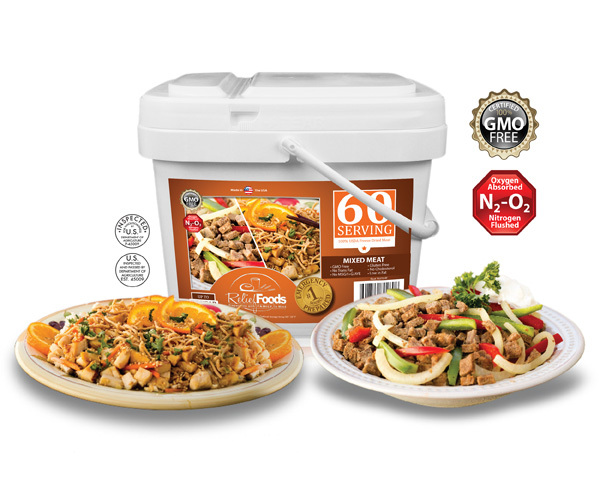 Relief Foods has packaged some of our top selling meal items in a durable three-gallon polyethylene bucket, created for space saving stack ability. This nutritionally packed selection will meet the needs of one adult for a two-week period, providing breakfast, lunch and dinner. 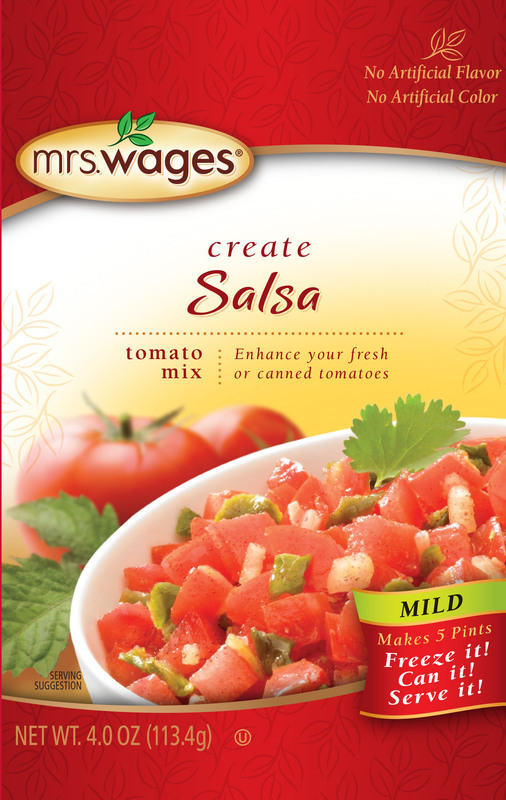 Included in this package is our delicious Rice Pilaf, Pasta Alfredo, Stroganoff, Potato Soup and Strawberry Creamy Wheat. Completing this package you will also receive our refreshing Orange Drink Mix. 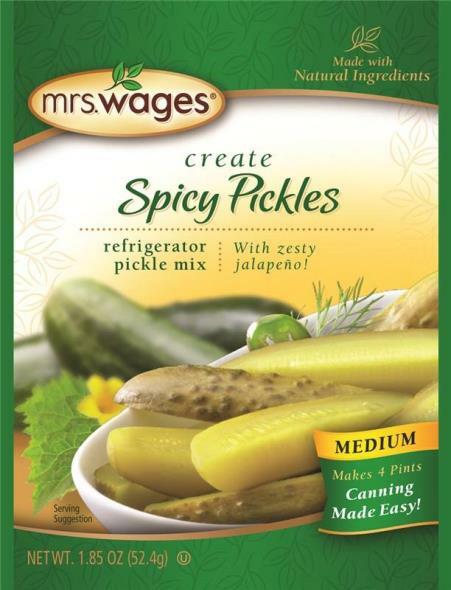 Relief Foods has combined easy to prepare, flavorful foods in this package, keeping family in mind. Included Inside: Rice Pilaf (12 Servings), Pasta Alfredo (12 Servings), Stroganoff (6 Servings), Potato Soup (6 Servings), Pancake Mix (16 Servings), Strawberry Creamy Wheat (6 Servings), Orange Drink Mix (8 Servings). Who would have thought you could get delicious Italian style food that will last you more than a decade, or even two!? 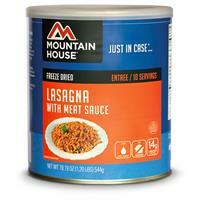 Mountain House Lasagna is made with classic pasta and real cheese in a mouthwatering meaty sauce. 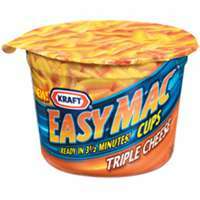 Your kids and family will eat this right up during an emergency, or even as a last minute back up for a family dinner. This authentic Italian dish truly places a world of flavor right at your fingertips. This bucket keeps you stocked up on the most important meal of the day for up to four-weeks. 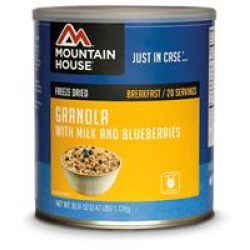 This package offers two of our long time favorite breakfast items, Strawberry Creamy Wheat and Pancake Mix. 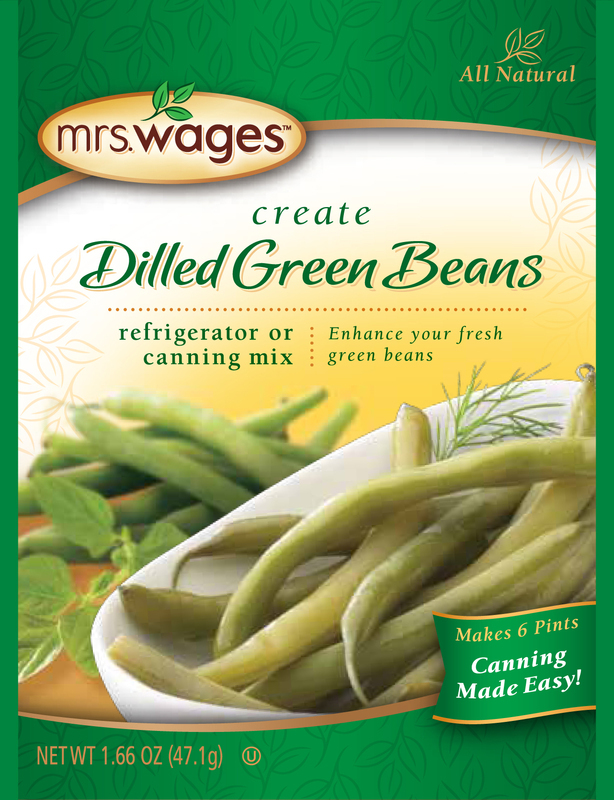 Stored in convenient Mylar pouches, these delicious meals can store for up to 25 years. 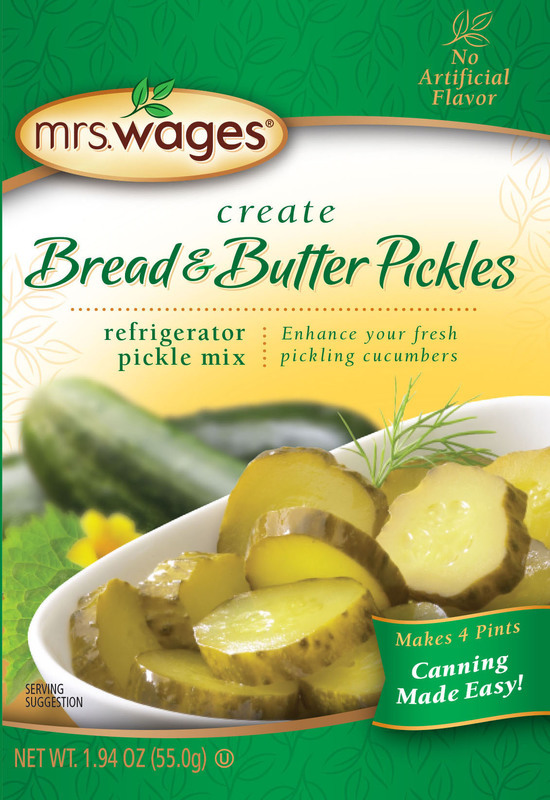 Easy to prepare and nutritionally packed, this is a perfect addition to any emergency food supply storage, prepared for you, keeping family in mind. 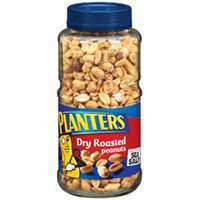 Protein is a necessary addition in completing your emergency food storage. 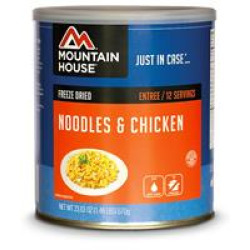 Relief Foods offers a way for you to add protein to your emergency food supply. Our wonderful freeze-dried chicken and beef can be added to any one of our entrées. 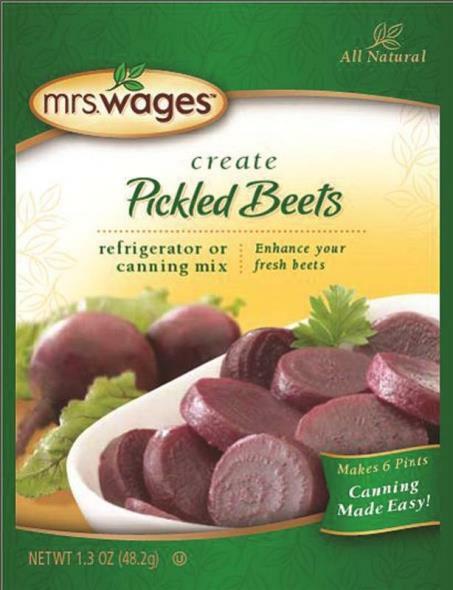 The meat is simple to prepare and can be stored for up to 25 years. Nutritious and incredibly tasting, these meat options will give you peace of mind, that in times of an emergency you family will be well cared for. Another Relief Foods bucket prepared with family in mind. Adding protein to your food storage is an important way to provide extra nutrition and healthy calories for your family. 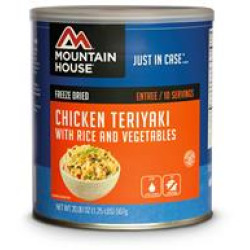 Our freeze-dried chicken is the best way to have delicious, long-lasting food storage options. The meat is simple to prepare and stores up to 25 years. 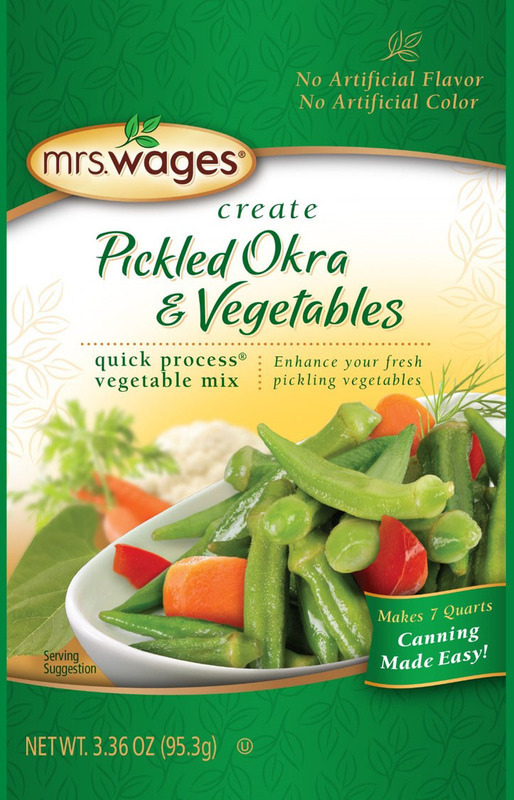 It is a perfect addition to our entrées, soups and side dishes. 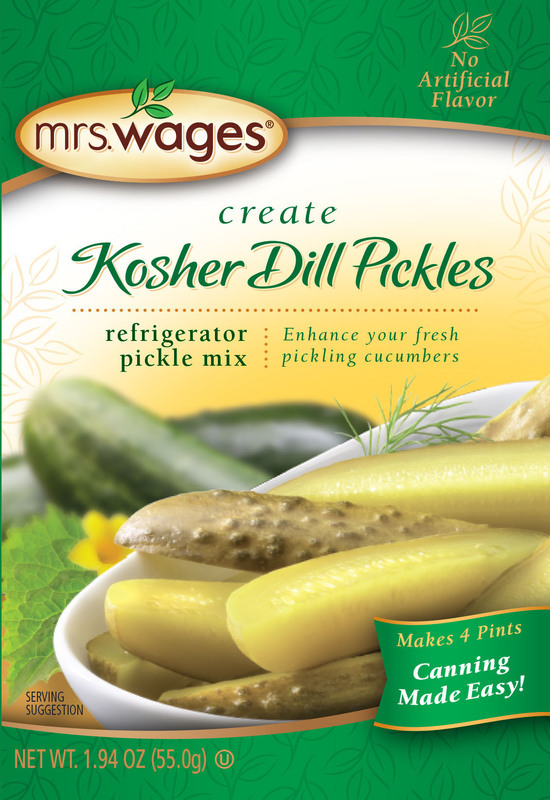 The perfect food storage addition, prepared with family in mind.